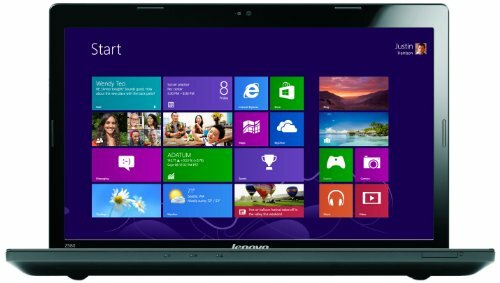 Below is our review of the Lenovo Z580, a 15.6" laptop, featuring 8GB RAM, 1TB hard drive and Windows 8. The Lenovo Z580 features a beautiful sleek exterior, with clean straight lines - the interior has a similar feel to it - it's nice to see manufacturer's putting thought into the design of their mid and lower end laptops. Inside you'll find a pretty impressive specification, especially considering that this notebook costs just over £500 (at the time of writing). Processing duties are handled by Intel's Core i5 3210M 2.5GHz Processor, which is helped by a solid 8GB RAM. This helps keep the notebook running very fast indeed - multi tasking was handled easily and without a noticeable loss of speed. In terms of storage you are supplied with a very generous 1TB hard drive - this will be more than enough room for the vast majority of users - this would in theory be enough to store around 1400 DVDs ripped at 700mb each - so we can't realistically see any problems with ever running out of space with this laptop. The keyboard is full width, and provides a comfortable typing experience - and despite the relatively small size of this notebook, Lenovo have also squeezed in a full sized number pad to the far right, which should benefit the number crunchers amongst us. As is typical of modern laptops, as a result of the numberpad, the touchpad has been shifted to the left hand side of center, so it lines up the centre of the keyboard. It performed well during our test period. The 15.6" screen offered a decent picture, with our testers liking the crispness and vibrancy - no issues here. You also have the added option of outputting the picture to an external screen via the HDMI port. In terms of connectivity you are presented with several options - 2 x USB 3.0 ports, 2 x USB 2.0 ports, HDMI output, so you can out the picture to a larger monitor or TV, Ethernet, VGA, headphone and microphone jacks, and a card reader and DVD drive. The operating system is Windows 8, which ran fast and without issues, as you would expect. So overall what did we think of the Lenovo Z580 notebook? And who is it aimed at? Pros: Well designed, very good specification for the money. Cons: There's very little to fault here. Lenovo may not be the most well known of brands, but in the Lenovo Z580 they have produced an excellent value laptop.